MONTEREY, CA, JULY 18—Once again, Joe Roberts was unbeatable in the MotoAmerica Superstock 600 class. The Wheels In Motion/Motorsport.com/Meen Yamaha rider earned his sixth-straight win (ninth of the season) to seal the deal on his first national championship at Mazda Raceway Laguna Seca. His championship rival, Yamaha rider Richie Escalante, led early but crashed in the last corner on lap four, which meant that Roberts was a shoe-in for the championship. Escalante rejoined the race, but ultimately retired a few laps later. With Escalante out of the picture the battle for first was between Roberts and Tuned Racing’s Bryce Prince. Prince kept his fellow Californian honest and took the lead on lap 10, but Roberts took it back and went on to take the checkered flag by .219 of a second over Prince. 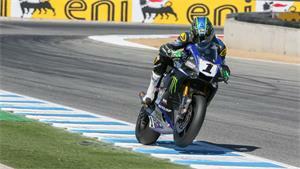 Back in a distant third was HB Racing Yamaha’s Michael Gilbert, making it a Californian sweep of the podium. Prince’s teammate Jason Aguilar was fourth ahead of Wyman Racing’s Travis Wyman and Mach 1 Motorsport’s Wyatt Farris. KTM RC 390 Cup points-leader Gage McAllister finished seventh on his NCR Yamaha. McAllister can also clinch the KTM Cup title later this afternoon as he only needs three points for the crown. Icon/Motorsport.com’s Andy DiBrino was eighth. And rounding out he top 10 was Ryan Matter on a privateer Yamaha and Cody Wyman on the Wyman Racing Yamaha. French Superstock 600 rider Jayson Uribe returned home to race this weekend, but unfortunately the homecoming didn’t go as planned and he crashed out of the race, adding his name to a long list of many fallers.